The strategy basis is the trading with low risk on the medium-term market trends. The average profit transaction is 15-50 pips that will not be qualified by brokers as aggressive scalping. ForexMarshalsSmart can trade with any of the broker who supports trading through terminal MetaTrader 4 and is absolutely legal product that does not harm any of the brokers and meets all offers and requirements of the leading brokers in the world. ZeroProfitLine - line that shows the level without any loss and virtual profit. False - line display is disabled. True - line display is enabled. NextOrderPipsDistance - minimum acceptable distance in pips, closer to which it is not allowed to place the next order to breakeven the position with the negative balance into the position without any loss. PendingOrderPipsDistance - distance in pips from the current quotation, on which the pending order is placed to enter the market. StopLossFixing - level of the loss fixing in pips. Only used in trading when the averaging is not used. TakeProfitFixing - level of profit fixing. Only used in trading when the averaging is not used. ActiveBlock - use of virtual take profit. True - the function is enabled. False - the function is disabled. ActiveBlockProfit - size of the profit fixing in pips when using the virtual take profit. PassiveBlock - use of physical take profit, which is set in the order to close the open position in the market in the terminal. True - the function is enabled. False - the feature is disabled. PassiveBlockProfit - size of the profit fixing in pips when using the physical take profit. Physical take profit must be greater than the virtual take profit minimum by one pip. TradingLot - volume of a trading lot. MM_method - method of MM calculation. True - from balance. False - from free funds. Attention! To enable the Money Management, you must comply with the rule. The setting “Lots” must be set to “0” (zero)! Accordingly in the setting, “MM_Risk” should be equal to the percentage of the risk. We recommend that the value of this setting should be within 0.1-0.3. 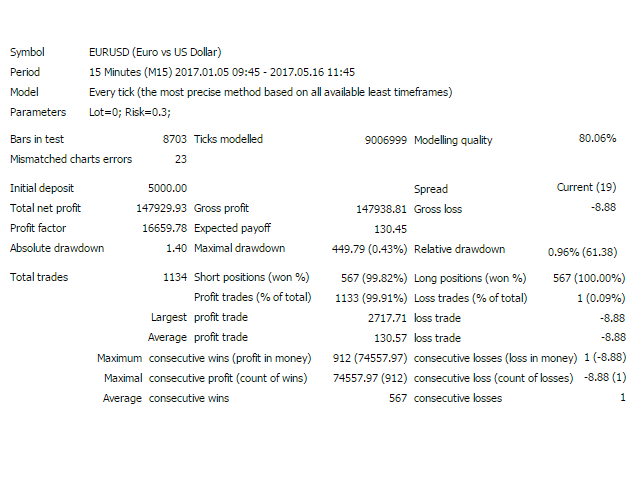 MM_Risk - percentage risk “1” is equal to 1% of the selected “MM_method”. AccountBalanceStopLoss - stop loss of the account balance. It means, if it is set as 20%, when the account drawdown reached 20%, all opened orders are closed and all pending orders are cancelled. 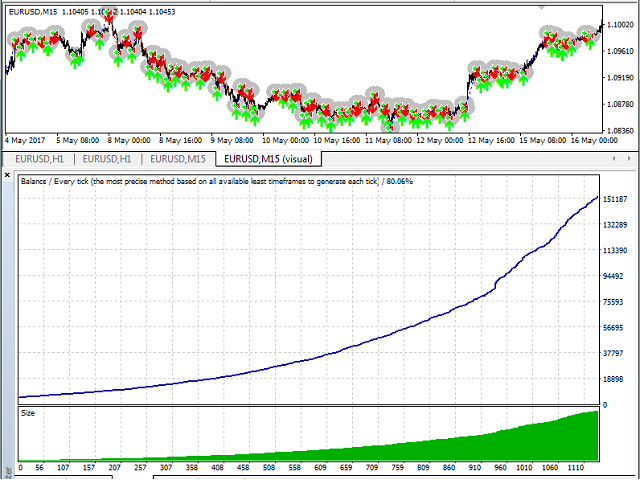 PairSpread - average spread size of the currency pair, on which the EA is installed. OrderExecutionSlippage - acceptable slippage size in pips when the broker executes the orders. Re_quotesNumber - number of re-tries to transfer the order for broker execution in case of re-quotes. HistoryBars - number of the last bars/candles from the current bar/candle which are compared to market history by the EA. MagicNumber - magic number. Position ID. You should have any different number for each trading pair you are trading. If you are trading on five trading pairs, this number should be different on each currency pair you trade. CommentsCount - number of comments presented in the left top corner of the chart. ALERT - alerts (false/true). The EA notifications. InformationScreen - false/true. The screen with EA trading information. color_negative - color of the negative values. color_positive - color of the positive values. Обновление стратегии в работе советника.